Released on August 31st, 1987, Michael Jackson’s Bad album became of his most successful albums selling nearly 45 million copies worldwide. The album also produced several number one hits, five to be exact, which included I Just Can’t Stop Loving You, Bad, The Way You Make Me Feel, Man in the Mirror, and Dirty Diana. Not many artists since then have had as much success in regards to that many number one hits from a single album. Katy Perry’s album in 2010, titled Teenage Dream, tied Michael Jackson for the most number one hits from a single album. 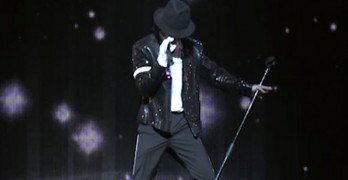 Nobody has yet to dethrone the king of pop with six number one hits, and that record will probably stand for some time. In the short film below Michael Jackson plays the role of a black man who is caught between getting an education to better himself, and the urban blight he has to return home to every night. On a daily basis, he is faced with the challenge of doing what is right, or what is wrong. 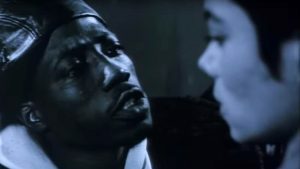 The film also stars another well-known actor that many of us have grown to love, Wesley Snipes, who is constantly trying to make Michael do the wrong thing. He challenges Michael to not forget where he came from, who is friends are, and to remember that he is not “bad” while he mocks him for going to school. Michael intervenes in what appears to be a racially motivated mugging led by Wesley, and this is where the song takes over. Michael is able to stop the crime as he confronts his friends about their actions as he screams, “You ain’t bad, you ain’t nothing…you ain’t nothing!”. The short film ends on a good note where Wesley and Michael come to an understanding as they shake hands and go their separate ways.